Our traditional Grove range shown here, has a rather contemporary feel and proves just how different a design can look from one room to another by the clever use of colour and materials. The base cabinets painted in Farrow & Ball ‘Plummet’ are paired with walnut wood wall cabinets and topped with a Burled Beech Corian countertop which is also fitted as a splash-back above the induction hob. 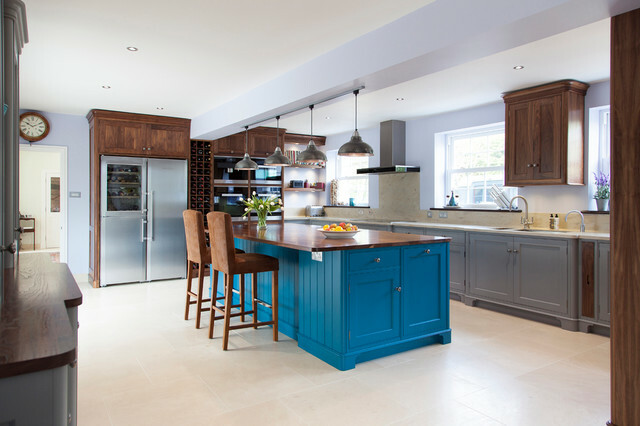 Such a large space demands a focal point and the central island painted in striking ‘Teal Tension’ certainly catches the eye. The over-sized fumigated oak top on the island offers ample workspace and a generous seating area. An independent double door larder cupboard is a must have in a room this size and comes complete with all the additional accessories including handmade oak racks and wicker baskets. really like these floor tiles! - please can I ask where they are from and the colour? Hello, the colour of the island is Teal Tension. Not crazy about the dark wood and bright blue. I like the cabinets and the look and size of the appliances. I have never seen a fridge like that. "Feet" on cabinetry to look like furniture.